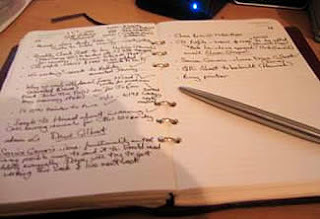 How owning a notebook makes you a better person.. I don’t keep a diary. I’ve never been that interested in recording thoughts that I thought everyone would have considered and mulled over. To me, it just seemed like a bit of pointless exercise. Not anymore… yes, I’ve succumbed to the wave of planners who tote them around; I now have a moleskine. And it’s really bloody useful. Inspired by Richard’s 4 point dissection of brand ideas, I’ve recently been doing a few myself in this notebook. As well as getting down some thoughts/quotes I quite like. No self masturbatory diary esque thoughts yet, but I have been mulling over (as an offshoot of my infantile brand idea thinking) further thoughts on just how I’d improve brands and their position in the market. Place me firmly in the fan of the notebook camp. Also, much as I’d have liked to get a notebook which wasn’t a moleskine, I pretty much had no choice – there really aren’t any other viable alternatives that I could find (and who could resist the blurb about who has used their notebooks before?). ← Happiness is a cigar called Hamlet..
Allrighty Will! Good to see you got your hands on a good ol’ moleskine. I’ll tell you what, the little spiel you get inside what with:“SEIZING REALITY IN MOVEMENT, STOPPINGTIME, CAPTURING DETAILS. MOLESKINEACCUMULATES EMOTIONS TO RELEASE THEIRENERGY GRADUALLY OVER TIME.HERE ARE THE TALES OF THOSE WHO HAVEMADE IT A LEGEND…”really does the trick for me. A notebook is only a notebook until you give it life, the deep vibe and creative heritage that Moleskine peddles is perfect. I think it’s all about “self masturbatory diary esque thoughts”, let your hair down! Phaedrucide! Hope to see you soon buddy!